what do you do when you have a lot of little scraps of fabric but no real use for a small quilt? Small bags — for decks of cards, cribbage boards, magic wands, family heirlooms, game pieces, gift-giving — are fairly simple. Even with a lining of a contrasting color, they’re not terribly complicated. Most of them are simple straight-stitches on a machine. Point the sewing machine in the right direction, and go. All of the bags here have basically three seams: one for a drawstring or ribbon casing; one for the side of the bag; and one for the bottom. They’re not intended or designed to hold up to a lot of abuse; but they could. Seriously, they’re pretty well-made for being made from scraps. But why make them? For being so general purpose, they’re remarkably hard to use well. 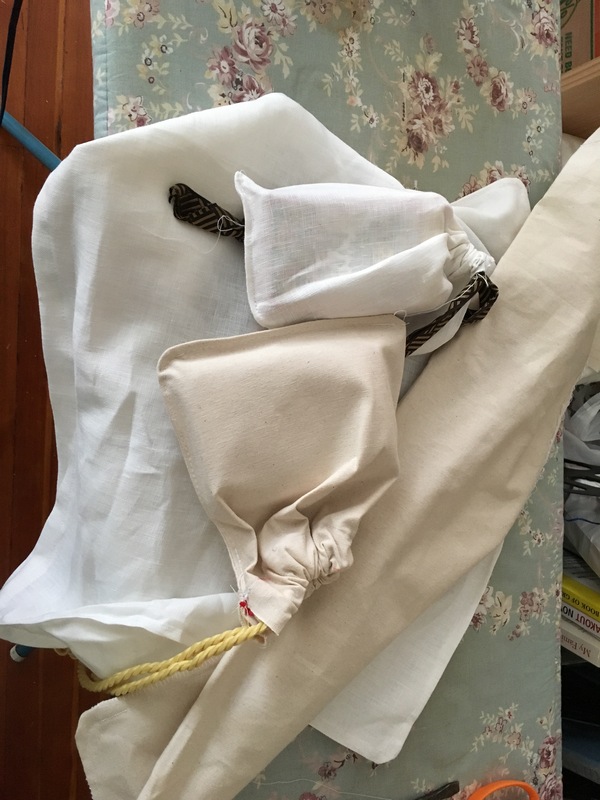 Still they teach important sewing lessons: pinning, ironing, making casings for drawstrings, pulling a drawstring, and making linings (in two different ways). They teach fabric selection and color-scheming and cutting and assembly. And they teach turning, too, which is the basis of pillow making as well. Plus there’s the always popular dice option.